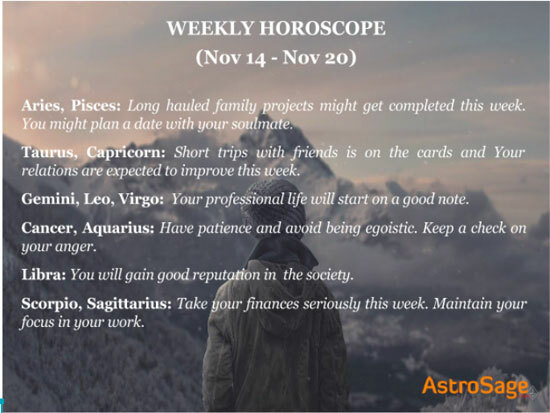 Plan your week with this Weekly horoscope 2016, from November 14 to 20. Read the predictions below given by our panel’s expert. Also, read the remedies given. Arians, a good health will be maintained throughout the week. In the mid-week you may go on a trip. The long hauled projects related to family, can be completed now. This is the correct time. During this, workload might increase, but with this, fame and success will also knock the doors. Love Prediction: Though this week is predicted to be pleasant for love relations, minor carelessness might lead to quarrels with your partner this week. Onset of the week will give you ample opportunities to stay in touch with your beloved. Mid week is also predicted to be blissful. This week would be a good time to enjoy leisure activities and entertainment together. Week is expected to end on a happy note. Taureans, in professional life, favorable time is foreseen. But, only if you do hard work. More than handful of income will be received which might result in increase of expenses. While your health looks stable. Some small trips with friends is possible. Chances are there that you might turn yourself towards the path of spirituality. Love Prediction: This week would be a good time to celebrate the bond you share with your beloved. Though keep a tab on your stubbornness. Keep a check on your sensual behaviour and thoughts this week. This week might have a slightly dull start. You might not get to meet your partner as much as you might want to but by the middle of the week you will get opportunities to enjoy fine dining in each others company. Weekend might urge you to spend some quality time together. Geminis, your professional life will start with a good note. This week you will be able to surpass all the barriers. In order to get the desired result, you need to be calm. According to your cards, you will spend your most of the time in socializing online. Children will become the reason behind your happiness. Lastly, natives who are from journalism will reap success. Love Prediction: This week can be expected to fare well as far as your love relations are concerned. It would be a good time to promote your love relation to a marital one. Try to maintain the faith on each other as mutual trust is the foundation of any relationship. The beginning of the week is predicted to be blissful for you. By the mid of the week your relationship might feel a bit dull but weekend will come with a promise of bringing back the lost charm and romance in your bond with your beloved. Cancerians, this week is a blend of favorable and unfavorable outcomes. Luck ratings are also good. You will be able to enjoy your love life now. As it will provide you joy and happiness. Your bank balance will now increase. It is suggested to have patience and avoid being egoistic. The Mantra for you is to Yoga on daily basis. Love Prediction: Abstaining from quarrels with your lover would heighten the love in your relation. Trying to maintain the peace and harmony in your relation this week would be of utmost importance to you. Those in love with a colleague of theirs are predicted to enjoy the onset of the week the most. Middle of the week promises to induce your relation with love and understanding. Weekend can be expected to be pleasant and fun-filled. Try to maintain the decorum of your relationship this week. Lions, get happy, this week you will receive an ample amount of income. Couples who are married, are likely to receive presents from in laws. Office goers will do great in whatever task they perform. Whereas, in domestic life some problems from children might come up. This week is suggesting you to believe in yourself. Lastly, love birds will have a cherishable moments. Love Prediction: This week might be a little unpleasant for those who are romantically involved with someone from a different caste. The week is expected to have a blissful beginning. Try to plan a trip with your beloved to enhance your spiritual self. Middle of the week is predicted to be joyous. Those in love with a colleague will be able to enjoy this week fully. Weekend can be expected to end on a happy note. Virgonians, the beginning of the week looks very fine. However, in the mid-week, you have to think about some matters seriously. You will observe progress this week. This week you might get a chance to meet some old friend. Your love life will be spent in peace along with the bonding getting stronger. Love Prediction: Try to keep a tab on your egoistic self this week and keep a watch on your conduct with your beloved. Abstaining from abrupt lashing out and immoral behaviour will give you good results this week. Try to maintain the decorum of your relationship during the onset of the week. Middle of the week and weekend can be expected to fare well. You will be able to establish an equilibrium between your work and your love life this week. Librans, this week will turn you religious. You will gain a good reputation in the society. 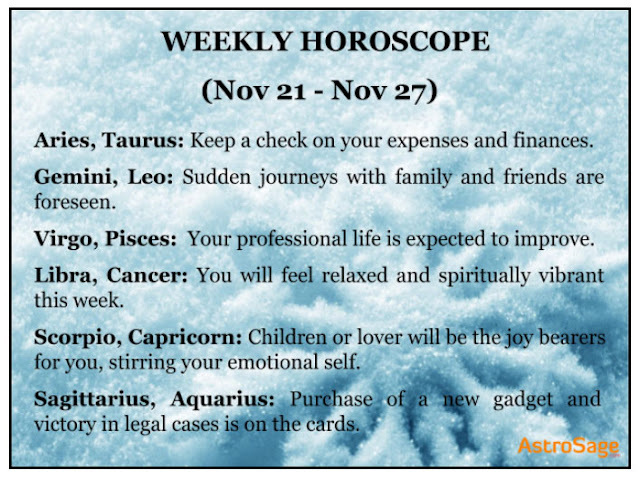 In your cards, it is clearly foreseen that money will enter your life. In professional life, some ups and downs might be possible. Your expenses might go up, so have control. The long pending work will get resolved now. Love Prediction: You might feel easily irritable this week for some unknown reason. Steering clear from irritation and abrupt mood swings would give you good results this week. The onset of the week can be expected to be quite pleasant for you. Married couples will be able to make the most of this week. Middle of the week might seem a wee bit dull but the weekend is predicted to be fun-filled. You will be able to acknowledge and enjoy the love and romance in your relationship this week. Scorpions, favourable results are foreseen if you work extremely hard. This week your financial matters are required to be taken seriously. Whereas, mid-week seems very much favourable. You might plan a journey, which will help you to gain profits. If you work hard, you will certainly achieve success. Love Prediction: Try to prioritise your family and love relationship equally this week. This week is predicted to be bitter-sweet for your love relation. Try not to indulge in any discussion related to your love affair with your family members this week. You might get involved in light tiffs with your partner during the onset of the week. Middle of the week is expected to fare well for you. Though weekend might seem a little drab. Try to maintain the decorum of your relationship by the end of the week. Sagittarians, this week is a bag of mixed result. If any problem is going on in your married life, then it will likely to get over. Though business life does not seem to be okay. On some situations you might feel stressed. Thus, acting calm will help. With siblings in the house, some quarrels are likely to arise. The suggestion for you is stay focussed on your work, weekend will be enjoyable. Love Prediction: This week is predicted to be refreshing and cheerful for your love relation. You would be at the peak of your romantic self. Though, tiffs originating from ego can be expected with your beloved. The week will begin on a positive note. 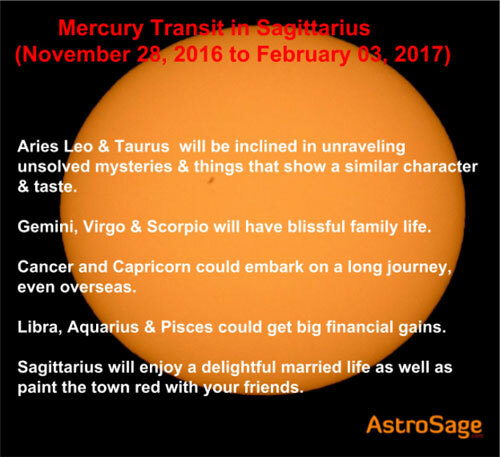 You might experience maturity and stability in your love relation this week. Middle of the week might urge to get involved in squabbles with your partner while the weekend is expected to be a wee bit drab. Try to maintain the decorum of your relationship during weekend. 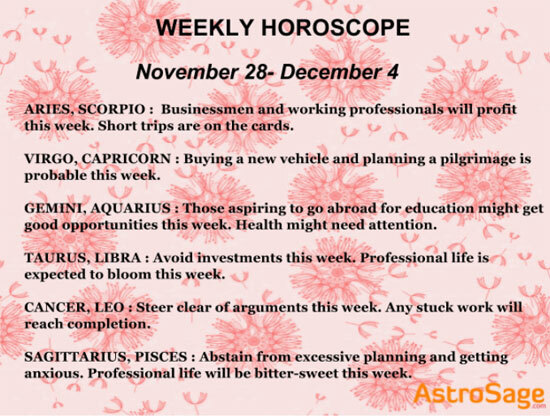 Capricorns, week will start with a big bang. Your plans will get successful and will help you to achieve profits. In the mid week, you might feel adventurous and would like to do something adventurous. This week, your relations will improve and happiness will be achieved. Be cautious, chances of getting deceived by someone is possible. Love Prediction: Try to refrain from indulging in unnecessary arguments with your beloved this week. Your week might have an emotional beginning. Work and stress at home might keep you away from your beloved this week. Mid of the week can be expected to be pleasant. The week is predicted to end on a happy note. Your efforts to keep your partner happy and satisfied will pan out well. Married couples will be able to make the most of this week. Aquarians, promotions are in the cards. Also, you might experience some profitable journeys this week. Just make sure to have control on your anger. Aquarians, who are pursuing their qualifications needs to have focus. An argument with soulmate might occur. Thus, be careful. You are advised to drive carefully in order to avoid mishappenings. Love Prediction: Work pressure might keep you away from your beloved this week. Onset of the week will give you ample of opportunities to spend quality time with your beloved. You might get to meet your partner and indulge in leisure and entertainment with them during the middle of the week as well. Meeting and spending time with your lover will fill you up with delight and contentment. Weekend is predicted to be pleasant and upbeat. Withhold from indulging in unnecessary arguments with your beloved. Pisceans, in the beginning of the week some challenges might be faced. Electronics gadgets that connects you from other might be a troublesome. In the mid-week things are looking great. You might plan a date for movie or dinner with your soulmate. It would be great if you maintain the distance from betting. Just show your talent and make others crazy for you. Love Prediction: This week can be expected to be favourable for your love relation. You might treat yourself and your lover with a nice romantic meal. Indulging in entertainment and leisure activities with your love partner is also on the cards. Do not plan to meet your beloved under risky conditions during the middle of the week. Weekend is predicted to be pleasant. If you have just gotten into a love relationship, then try to keep a tab on your emotional self this week. Dev Uthani Ekadashi is a day devoted to Lord Vishnu. As per popular beliefs, Lord Vishnu woke up on this day after sleeping on Dev Shayani Ekadashi. Read on to know more about this auspicious day ! Dev Uthani Ekadashi or Prabodhini Ekadashi is believed to be a very propitious day. Prabodhini Ekadashi, literally meaning ‘the awakening eleventh’, is celebrated on the Ekadashi tithi of Shukla Paksha in the month of Kartik. This day is devoted to Lord Vishnu and is celebrated to acknowledge the end of his sleep which had begun on Dev Shayani Ekadashi. The legend associated with this day has given it many names like Dev Uthani Ekadashi, Dev-Prabodhini and Deothan. This year, Dev Uthani Ekadashi will be celebrated on the 10th of November which is the Ekadashi tithi of Shukla Paksha of the month of Kartik. The fast of Dev Uthani Ekadashi should ideally be broken at Parana Muhurat and should be terminated by Dwadashi Tithi which falls on the succeeding day. 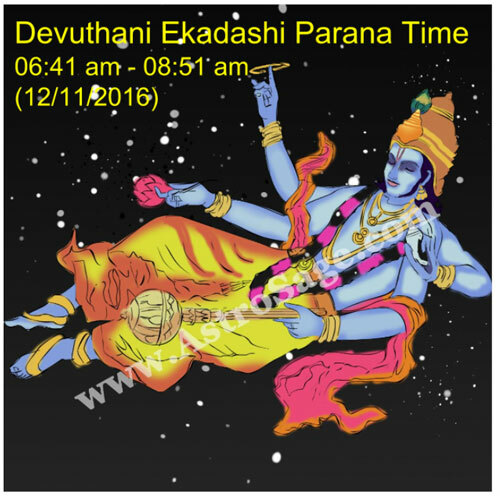 The Muhurat timing for Ekadashi Parana Muhurat is 06:41 AM to 08:51 AM on 12 November 2016. Ekadashi Tithi begins at 11:21 AM on 10 November 2016. Ekadashi Tithi Ends at 09:12 AM on 11 November 2016. According to the popular legend, the irregular sleeping pattern of Lord Vishnu was leading to a lot of problems on Prithvi Lok and for the Devas. Sometimes Lord Vishnu would sleep for days incessantly and sometimes he wouldn’t sleep at all. This made Goddess Lakshmi upset and concerned. Because of Lord Vishnu’s erratic sleeping pattern Devas had to wait for days to meet him. Moreover, the Asuras were taking advantage of this fact and were spreading Adharma on Prithvi Lok. After consistent requests by Goddess Lakshmi, Lord Vishnu decided to come up with a solution for this problem. In the meantime, Devas informed Lord Vishnu of the theft of Vedas by a demon called Sankhyayan. After fighting for days on end, Lord Vishnu defeated Sankhyayan and got back the Vedas from him. After the exhausting fight and reacquisition of Vedas, Lord Vishnu slept on Ashadha Ekadashi for four months uninterruptedly and woke up on Kartik Ekadashi. Hence, the day of Kartik Ekadashi is also known as Prabodhini Ekadashi. This legend gave birth to the celebrations of Dev Uthani Ekadashi. On the day of Dev Uthani Ekadashi, devotees take a holy bath, early in the morning, and perform the ritual of marriage of Tulsi plant and Lord Vishnu. This ritual is also called Tulsi Vivah. The fast of Prabodhini Ekadashi begins on Dashmi, a day before Ekadashi, and continues till Dwadashi, which is the day after the day of Ekadashi. The fast should be broken on Dwadashi, as per the Parana Muhurat. It is believed that Dev Uthani Ekadashi is one of the ways to attain salvation. If one celebrates Dev Uthani Ekadashi with utmost sincerity and follows all the rituals with absolute devotion, then he/she will receive Moksha after death and will be able to reach Vishnu Lok. The day of Dev Uthani Ekadashi is also known to have the boon to give Moksha to the souls of one’s ancestors. In Maharashtra, the day of Dev Uthani is devoted to a reincarnation of Lord Vishnu, Lord Vithoba. This day is celebrated with much fervor at Pandharpur where devotees assemble in huge numbers for a period of five days. The prayers and festivities held at Pandharpur are also known as Sarkari Puja. In Rajasthan, Dev Uthani Ekadashi takes a more fun avatar. Devotees celebrate this auspicious day in the form of Pushkar Mela at Pushkar in Rajasthan. 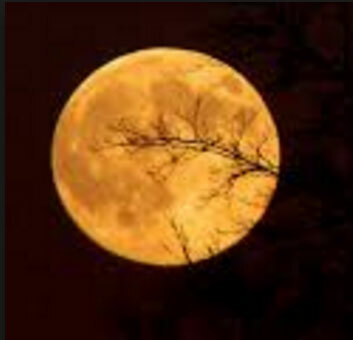 The festivities beginning on Ekadashi end by Kartik Purnima. Pushkar Mela is organised to worship Lord Brahma and to put together Asia’s largest Camel Fair. It is believed that taking a holy bath in Pushkar lake on this particular day brings one closer to attaining Moksha. In Gujarat, it is believed that Lord Vishnu resides around Mt. Girnar during Dev Uthani Ekadashi. Hence, the devotees organise a two day long parikrama around the mountain to pay their respect and ardor. Every year, about 80,000 devotees gather around Mt. Girnar for worshipping Lord Vishnu on this particular day. Make the most of this Dev Uthani Ekadashi by performing all the rituals with utmost dedication and at accurate Muhurats. May Lord Vishnu bless you with his choicest blessings! 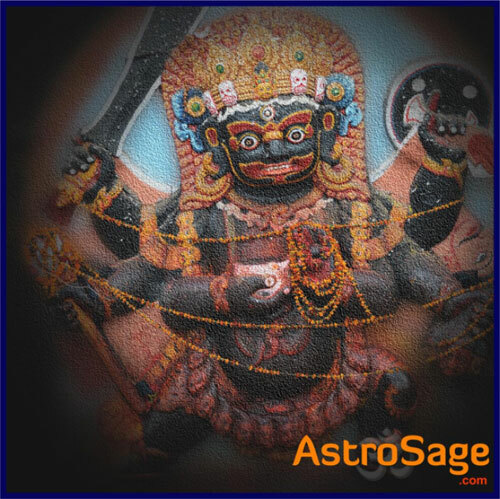 We at Astrosage, wish you a very Happy Dev Uthani Ekadashi!